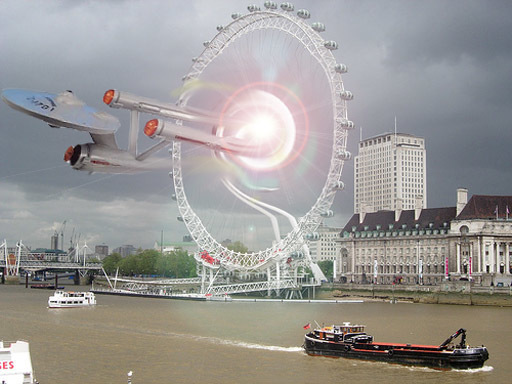 Few would have suspected that the London Eye harbours a transdimensional wormhole. Including the crew of the NCC 1701, who stumbled through the anomaly, only to collide with Portcullis House (not pictured). Image may not be based on actual events. Background photo taken from The Killer Biscuit's Flickr photostream. Keep sending in those doctored images of London to londonist - at - gmail - dot - com. There will be a prize for the best entry at year's end.